Breathing life into sculptures, that is, making them come alive, is in the balance of form and feeling. You really have to know what's underneath, the bones and muscles that give structure to form. Then you have to feel how a horse experiences life, expresses movement and emotion. 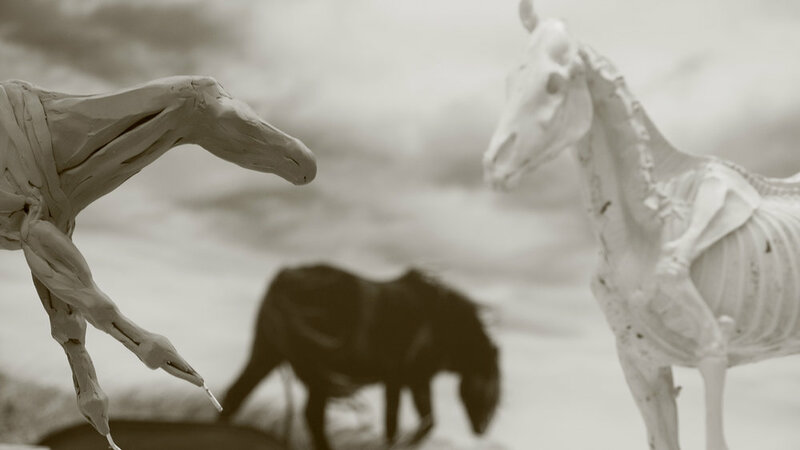 The sculptor's job is to get themselves out of the way so that horse can start breathing on its own. Liquid rubber or “Tuffy” sits waiting to make molds, an exact negative of the sculptor’s original clay. Soft, flexible molds are encased and protected by a hard shell of Plaster of Paris so that they keep their form. A highly detailed stage with Sharon demonstrating “chasing wax”. All the imperfections from the previous stage are meticulously removed and any missing details painstakingly restored to the artist’s original clay. A wax complete with “spruing” (brightly coloured red wax), which will become the gates or vents for hot gas to escape during the bronze pour. This stage is called the “investment” as layers and layers are built-up to create a ceramic coating on the wax. This shell needs to be strong enough to hold the molten bronze during the pour. Bronze ingots and any recycled cut-offs are being heated to 2200° F (1200° C). It takes an hour to reach this temperature in the furnace. Waxes inside the ceramic “investment” are heated in the oven. 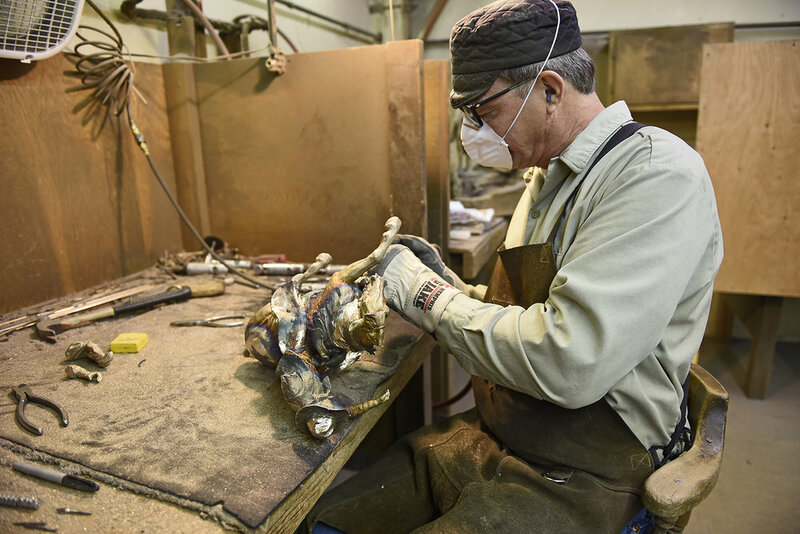 This is literally the stage that the wax gets “lost” as it melts and pours out, leaving the cavity, the perfect replica of the artist’s original work, ready to receive molten bronze. The only material that can withstand the heat and contain the molten metal is graphite. 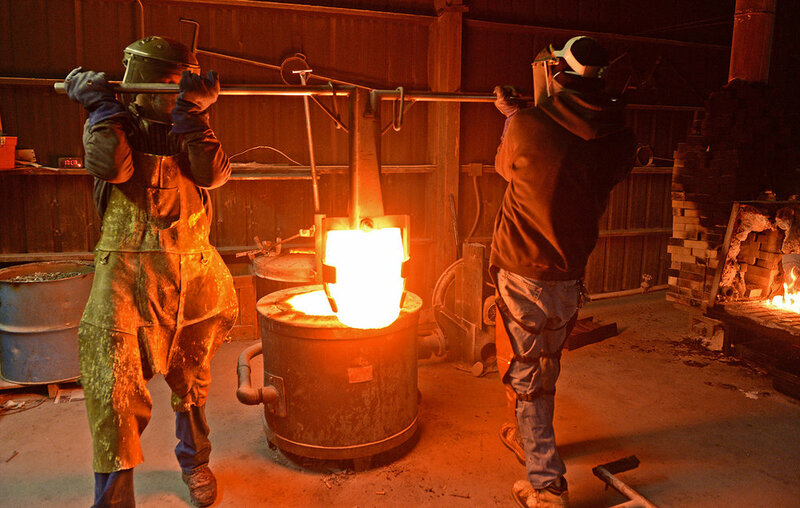 The liquid bronze is in a graphite crucible which is handled by a giant pair of steel lifting tongs, then placed into a set of pouring shanks. The most dramatic stage of all is when the molten bronze is poured into the investment shells to form the cast, and a sculpture is born. It is a loud, hot and ancient rite... dating back 6,000 years. Larger sculptures are cast in panels that are then welded together in the metal room. Every weld will need to be chased with grinding and sanding tools until it is seamless and smooth so that that artist’s original work is presented. The raw bronze cast, once released from the ceramic investment, still has the sprues attached (now bronze) which will need to be cut off and the surface smoothed. Here’s “Big Mike” in the metal shop welding and adding fine details like ropes and reins. The last stage is where the final finish, or “patina”, is applied by burning pigment into the surface of the bronze. Here is where colour and shading can be applied. It is the last stage before the finished bronze is mounted onto a base.